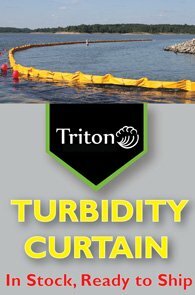 The Triton Type 1 Geotextile Turbidity Curtain is a fully permeable floating turbidity barrier, designed specifically for use conditions where there is no current. This calm water turbidity curtain's sturdy design features heavy duty geotextile fabric, a choice of 4" or 6" floats, grommet connectors, bottom ballast chain, and an available skirt depth choice of 3 to 10 feet. The Type 1 Geotextile Turbidity Curtain (also known as Type 1 Silt Screen) not only provides an effective containment area for turbidity, but also filters the water while allowing limited water flow through the curtain itself. Questions? Call the GEI Works team and ask about our type 1 sediment curtain at 1-772-646-0597 or request pricing. Best for use in calm water conditions, Type 1 Geotextile (Geo) Turbidity Curtain provides the maximum level of turbidity curtain filtration available. However, being constructed fully from 8 ounce nonwoven geotextile fabric, it is not designed to withstand current, wind or demanding conditions. Triton Type 2 or Type 3 Permeable Turbidity Curtains are a better option for use on more rigorous site conditions. Type 1 Geotextile Turbidity Curtain (also known as Type 1 Silt Screen), is a calm water turbidity curtain and commonly used in areas with low flow and for temporary containment. If you're looking specifically for Type 1 sediment curtain options for calm water conditions, please review our full range of Triton Type 1 Turbidity Curtains. Triton permeable floating turbidity barrier is available in several different styles, in addition to Type 1 Geo Turbidity Curtain. Geotextile curtains are floating barriers that control turbid water, allowing time for sediment particles suspended in water to settle. Additionally, they are available in several grades and types (including Type 1 Geotextile, HD & DOT). Use this overview to help determine which grade of Permeable Floating Turbidity Barrier is best suited for your location's conditions. While the Type 1 Geo Turbidity Curtain provides maximum access to curtain filtration, it is not the robust answer needed for sites where the silt curtain is exposed to current, wind, or other potentially damaging environmental conditions. However, the Triton Type 2 Turbidity Curtain Filter is designed specifically for areas with moving water, currents, waves or tides in mild to moderate conditions. Manufactured with high quality components, Triton Type 2 permeable floating turbidity barriers are recommended for use in location conditions that do not exceed 2 foot waves, moderate wind, or currents greater than 1 knot. For additional information, drawings, and specifications, please see: Type 2 Turbidity Curtain Filters. When it comes to filtering silt in fast moving water conditions, neither the Type 1 Geotextile Turbidity Curtain nor the Type 2 Turbidity Curtain Filter will do. Triton Type 3 Permeable Silt Curtains are the strongest available in floating filter barriers for use in silt and turbidity control. Designed specifically for faster water, waves or otherwise demanding conditions, Type 3 Permeable Floating Barriers are also available in both DOT compliant and Heavy Duty (HD) models. For additional information, drawings, and specifications, please see: Type 3 Permeable Floating Silt Curtain Options. Whether the job site demands Type 1, 2, or 3 Permeable Floating Turbidity Curtain, know that we're here to help. We can assist you in selecting the accessories needed, in determining the anchor placement, and even with installing the geotextile filter curtains. For help in selecting the model and type of silt curtain for specific site conditions, please reference: Turbidity Curtain Selection Guide or contact us. Questions about permeable silt curtain? Call the GEI Works team at 1-772-646-0597 or fill out our quote request form.